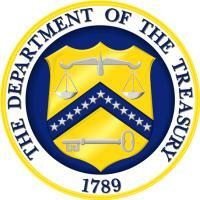 The United States Department of the Treasury is a Cabinet department. The Treasury was established by Congress in 1789 to help manage government revenue. The Department of the Treasury is administered by the Secretary of the Treasury and the Treasurer of the United States. The Secretary of the Treasury is a member of the President's United States Cabinet. The current Secretary of the Treasury is Jacob Lew, a former White House Chief of Staff, who was confirmed by the United States Senate on February 27, 2013. While the Department of the Treasury was created in 1789, the Office of the Treasurer was created by the Continental Congress in 1775. The first Secretary of the Treasury was Alexander Hamilton under President George Washington. Enforce the personal mandate provisions of Obamacare. The Secretary of the Treasury is the principal economic advisor to the President and plays a critical role in policy-making by bringing an economic and government financial policy perspective to issues facing the government. The Secretary is responsible for formulating and recommending domestic and international financial, economic, and tax policy, participating in the formulation of broad fiscal policies that have general significance for the economy, and managing the public debt. The Secretary oversees the activities of the Department in carrying out its major law enforcement responsibilities; in serving as the financial agent for the United States Government; and in manufacturing coins and currency. The Chief Financial Officer of the government, the Secretary serves as Chairman Pro Tempore of the President's Economic Policy Council, Chairman of the Boards and Managing Trustee of the Social Security and Medicare Trust Funds, and as U.S. Governor of the International Monetary Fund, the International Bank for Reconstruction and Development, the Inter-American Development Bank, the Asian Development Bank, and the European Bank for Reconstruction and Development. In order for Federal Reserve notes (e.g. paper money) to become legal tender they must be signed by both the Secretary of the Treasury and the Treasurer. The United States Mint and Bureau of Engraving and Printing also fall under the Department of the Treasury's jurisdiction. In 2003 some changes were made to the Department of the Treasury. The Bureau of Alcohol, Tobacco and Firearms (ATF) was transferred to the Department of Justice. The ATF's duties of tax and trade functions remained with the Treasury. The Federal Law Enforcement Training Center, United States Customs Service and the United States Secret Service were transferred to the Department of Homeland Security. This page has been accessed 27,529 times.